I’m writing this blog post on vacation, so it’s been a great week to focus on art and self-care in my own life. Of course, writing my blog on vacation is not exactly a great example of self-care because I’m still working, but at least I’m working on a beautiful balcony in New Mexico, enjoying the breeze and a view of the Sandia Mountains. During the first few days of our trip, we crammed in a lot of sightseeing and activities. While this was a lot of fun, it was not exactly relaxing. On the days that we had more open time, I’ve made sure to prioritize my self-care, going for a run or hike in the morning and taking time to make art later in the day. 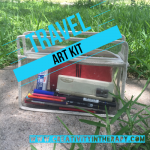 On this trip, I added a glue stick to my travel art kit so I could glue in memorabilia and collage images during the trip, as well as draw and paint as usual. It was nice to spend some time going through all the brochures and ticket stubs I had so far, gluing them in to my art journal, and then spending some time painting and drawing. When I take the time to make art while traveling, I love how it provides me with an activity that really encourages me to slow down, be present in the moment, and appreciate the beauty around me. 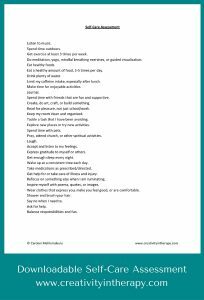 Since self-care is the theme of my week on vacation, I thought I would share a few resources and thoughts on self-care that you can use for yourself as a helping professional or keep in mind for client work. As therapists and counselors, we often talk about the importance of self-care but don’t always do a great job of actually prioritizing it. For those of us in the helping professions, good self-care is essential to preventing burnout. 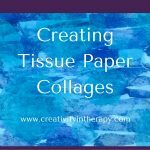 I often talk with my clients about self-care, coping skills, and distress tolerance. There’s some overlap, but I explain that distress tolerance skills are what you need when you’re really upset and you’re just trying to get through safely, coping skills are the things we do to manage less intense emotions or deal with problems, and self-care is the things that we should be doing all of the time. Self-care is what helps you manage the day-to-day stress so that it doesn’t build up too much. This is the self-care assessment that I have put together for clients (click here or on the image to open and download). It’s something that I’ve used with teenagers and with adults. Read through the self-care handout and mark items you are already doing in your life. Then star the items that you want to try in your life or need to work on. Think about whether you need to add more self-care to your life, what gets in the way of this, and what you need to change to make it happen. Of course this list isn’t exhaustive, so at the bottom of the list you can add other things that you consider self-care. 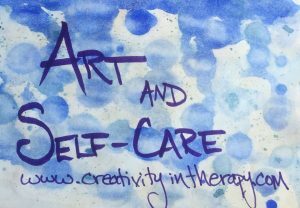 Whether it’s drawing, sculpture, coloring books, or crafts, making time for art can be excellent self-care. 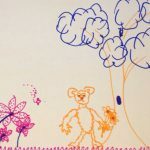 No matter what your ability level or amount of experience, art-making has been shown to lower cortisol (the stress hormone) levels. 1 Go somewhere lovely, peaceful, or interesting and then draw or paint what you see. As plein air artists throughout the decades have known, painting and sketching the world around you immerses you in the experience of the place and gives you a deeper appreciation for what you see around you. And it necessarily forces you to slow down and focus on the now, an important antidote to our busy lives of perpetual motion. 2 If you can’t go anywhere, make art about a past trip or other happy memories. 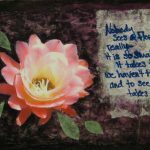 Making art about a positive event from the past can help you reconnect with those feelings and experiences for a little while, especially if you are making the effort to set aside other thoughts for the moment. 3 Make messy artwork. So much of our lives is often about doing things the “right way” or trying to create a particular, finished product. 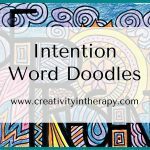 If all of your artwork is about trying to make things look a certain way, creating intentionally “messy” or “imperfect” artwork can be a good self-care exercise. Splatter, splash, or scribble…then have fun developing the piece. Focus on enjoying the process and the materials – don’t worry about the outcome. 4 Create a piece of art in response to a quote. Find a quote that inspires you, helps you shift your perspective, or reminds you of the meaningfulness of what you do. Spend some time creating a piece of art in response to the quote or incorporate the quote into your artwork. 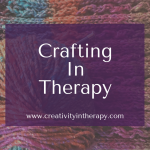 5 Create, craft, or color…anything! Create in whatever way you enjoy and find relaxing. Remember that the best artistic self-care is doing something that you enjoy, whether that’s painting a beautiful sunset, folding origami, coloring a mandala, or knitting a hat. It can feel good to create something, whatever the process was. 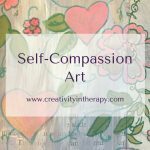 What artistic self-care do you make time for in your life? I’d love to hear! Share in the comments below.